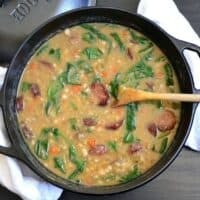 A hearty navy bean soup with sausage & spinach that is full of flavorful herbs and will warm you inside and out on cold winter night. The night before, sort through the beans to remove any stones or debris. Place the beans in a bowl and cover them with cool water. Allow the beans to soak in the refrigerator over night. Slice the sausage in to medallions and add them to a large soup pot along with one tablespoon of olive oil. Saute the sausage over medium heat until it is nicely browned (about five minutes). Drain off the excess fat. While the sausage is browning, dice the onion, carrot, and celery into small pieces. Mince the garlic. Add the onion, carrots, celery, and garlic to the soup pot after the sausage fat has been drained off. Saute for about five minutes more. The moisture released by the vegetables will dissolve any browned bits off of the bottom of the pot. Drain the soaked beans and give them a good rinse with fresh water. Add the rinsed beans to the pot along with the bay leaf, thyme, rosemary, some freshly cracked pepper, and 8 cups of water. Stir everything to combine. Turn the heat up to high and allow the soup to come up to a full boil. Once it reaches a full boil, turn the heat down to medium-low and allow the soup to gently boil for two hours, with the lid in place. You want the beans to go past the point of tenderness to the point where they are falling apart. Stir the pot occasionally. After gently boiling for a couple of hours, use a large wooden spoon to smash some of the beans against the side of the pot. This will help thicken the soup. Stir in the fresh spinach until wilted. Season the soup with salt. Start with just a 1/2 teaspoon at a time and add more until it is to your desired saltiness (I used 1/2 tablespoon total). Lastly, stir in the apple cider vinegar. Serve hot.